Cartoon copyright violation is a serious subject. As editors, consultants or authors surf the internet to jazz up their web pages or Facebook page, they notice a cartoon in an online cartoon catalog. They download the image and post the artwork on the page or pages and give the cartoonist a “credit” as owner of the artwork or as the source for the comic panel in question. On the contrary, it isn’t that easy or simple to publish a single panel gag cartoon. Cartoons that appear on the web are not public domain. The Copyright Revision Act protects cartoons and other creative works such as graphics, text, videos, illustrations etc., and the Digital Millennium Copyright Act also enhances and protection online, that much better. When taking into consideration your web site or Facebook presence or any other photo sharing site you maintain, the most common copyright violation is the use of images found on other websites (including cartoons! ), without obtaining a reprint license from the owner(s) of those works. Eric Gale is a copyright attorney in California and his specialty is copyright infringement cases. Gale has noted that over the last 5 years (as of this writing), copyright violations have spiked and has indicated that number has remained steady ever since. Could this be possibly due to the popularity of social media or online business promotion? Many web designers or webmasters and those who may be just starting out in the graphic design field as web authors are not aware of legal requirements to secure a licence for cartoons and other types of materials used online . . . when in fact, it is so simple to protect your web property by contacting the original owner of the artwork. Many business professionals and web designers are not aware they are responsible in acquiring copyright permissions from cartoonists, whether they build the site themselves or hire someone to build their site for them. While using copyrighted cartoons might be unintentional, those penalties can include retroactive licensing fees for each copyright violation and could result in a website ban. Reported damages could be between $1,000 and $2,000 per image violation. However, damages could range from $750 to no more than $30,000 per cartoon. If a court finding rules that the violation is “willful” (intentionally used with no permission from the cartoonist), the fine can jump upwards to $150,000 for each violation. New technology also makes it easy to identify copyrights that are infringed. For instance, cartoons may have invisible identifiers such as watermarks that are embedded into the images that can be found through web searches. If a copyright is violated, normally the cartoonist will send a first “cease and desist” letter requesting a royalty and immediate removal of the comic. Violators are usually advised to contact their web designer immediately or they can remove the artwork themselves if they are the web designer. Cease and desist letters usually provide documentation of the copyright violation, and are supplied with the “stop the infringement” notice to avoid inequitable conduct. The letter also serves “to provide a basis for claiming that any continuation of infringing conduct after receiving the notice is willful”, that opens the door for a significant increase in fines. If you’re setting up your site yourself, search cartoons from the cartoonist of your choice and negotiate directly, based on the terms set forth by the cartoon image provider. Most cartoonists are very easy to contact and have image galleries that are easy to search. Cartoon image libraries are plentiful on the internet and some do, offer royalty-free cartoons but they’re not “free”. 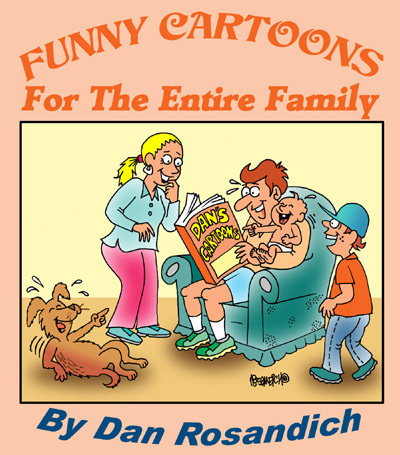 Cartoons can be purchased individually, in a group or by subscription. Royalty-free cartoons do have licensing terms, so understand the restrictions. Beware of “rights managed” cartoons requiring a fee to license the cartoon for a set period of time in a specific usage. For instance, using a cartoon or comic for one year on your website only, and in no other digital or print form. Many public domain clip art or cartoon sites allow use of images that credit the cartoonist or the source, but these sites require you sign a release. Know what those “terms” involve before you agree to any of those terms. 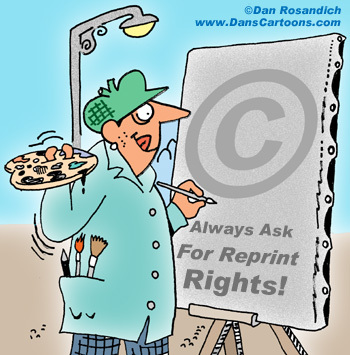 Be certain to secure written permission before publishing cartoons or copyrighted cartoon characters.